Yeisy Rodriguez is probably one of the most socially conscious 20-year-olds you’ll ever meet. She’s educated on subjects such as climate change and animal cruelty and hopes to teach others about their lasting effects on the environment. But her teaching methods don’t involve lectures or waxing poetic on YouTube videos. No, her methods are much more creative. Blackfish by Yeisy Rodriguez is a three-color screen print that depicts an orca in a plastic bag, comparing it to goldfish given as prizes at fairs. Yeisy was born in Miami to Cuban parents who moved to Florida in 1995 to escape Fidel Castro’s regime. Her parents had family in the U.S., which made the transition easier but they still had to adjust to speaking English and living in an unfamiliar country. Yeisy’s parents encouraged her love for the arts and animals. The Rodriguez family went beyond the “must love dogs” mantra as pets also included birds, cats, dogs, hamsters and bunnies. When she was seven years, Yeisy also started discovering her inner artist by attending art and painting classes. At 14 she began to question what she wanted to pursue as a career, but as she delved more into her art, which she says started out as a hobby, she realized that art had become her calling. “I didn’t think I would do it as a career,” she says. “When I went to college I had to choose a major and I chose art. It was easy because I would think of all the other things I could major in and none of them felt right.” But despite the easy choice, Yeisy still had her doubts because she knew little about the art world and had no idea where to draw her inspiration. Also at 14, Yeisy, like most girls that age, started wearing makeup. But unlike a typical teenager, questions would later surface about how her makeup products were being made. Yeisy’s epiphany spurred her to research countless beauty companies and the ways to prevent cosmetics testing on animals. But it also urged her to create art that she hoped would raise awareness and most importantly educate people on some of these issues. 99°, 99% by Yeisy Rodriguez is a five-color screen print, depicting sea turtle populations in the warmer, northern beaches, with only one male turtle in the center, surrounded by 99 female turtles. Yeisy also likes incorporating numbers into her work and believes that when statistical information is presented visually, it can be “really impactful.” For example, her digital piece titled And then there were two is based off an article she saw in October 2017 that detailed how, because of a “record amount of summer sea ice and an unprecedented rainy episode,” all but two chicks of a colony of about 40,000 Adélie penguins died of starvation in Antarctica. Another piece titled 99°, 99% also shows how rising temperatures are causing sea turtles to turn female. And while this may not seem like a big deal, scientists have started to question how the sea turtle population will sustain itself when, years from now, there’s a chance there will be no more males reaching adulthood. Stories such as these are a huge influence in her work, which features 2D and sculpture pieces, acrylic, water color, ink, graphite, prints, gouache and oil painting, which she says is her favorite medium to work with because she’s most “familiar” with it. There’s a Catch by Yeisy Rodriguez is reduction woodcut depicting a fennec fox about to be captured. The fennec fox is not considered endangered but is affected by pet and fur trade. 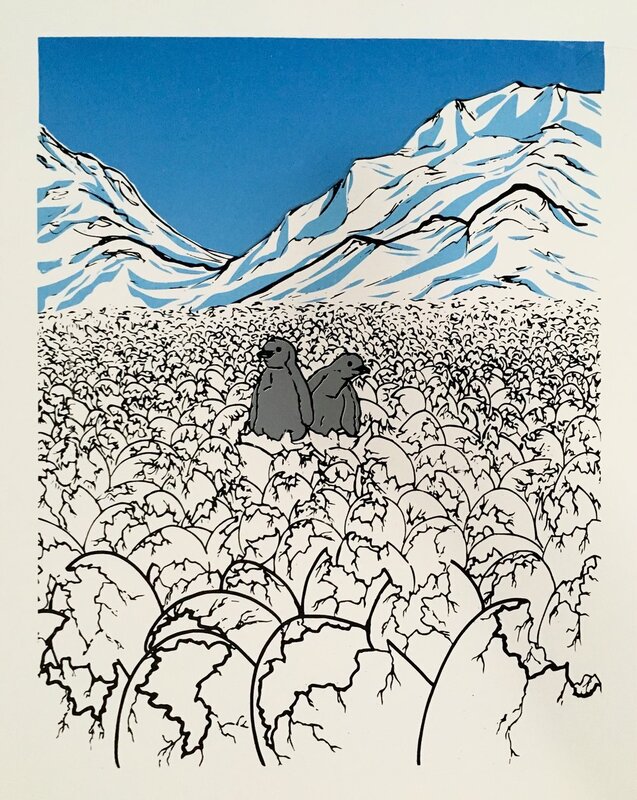 And then there were too by Yeisy Rodriguez is a four- color screen print based on news that emerged in late 2017 about the thousands of Adélie penguin chicks that died of starvation. Ghosts by Yeisy Rodriguez is a linocut that features the five species of lemurs most commonly sold as pets. Ninety-one percent of 103 lemur species face extinction as a result of pet trade and climate change. 101 Minks by Yeisy Rodriguez is a woodcut that features two fur coats and a mink. The fashion industry is moving away from the use real fur but the lives of millions of animals are lost every year to the fur industry. Yeisy’s art didn’t always have the same powerful message it does now. In fact, when she was entering college, she applied for the BFA program and didn’t get in because her work didn’t have an overall message. She spent the summer building her portfolio in the hopes of applying again but never did because she no longer felt like she needed the program to confirm that she was a great artist. Learning more about a particular subject has also allowed her to become more confident in her work and have a newfound appreciation for the craft. Yeisy believes art’s role in society goes far beyond visual aesthetic. Artists, like any revolutionary, have a duty to speak to the world’s injustices – whether political, environmental or racial. And while she realizes that a career as an artist may not be the most stable profession, for her, art isn’t about making money but rather making work that’s true to what she stands for. As for how she plans to do that, Yeisy, who graduated from Florida State University in May, wants to one day open her own art shop and have a portion of every sale go to a charity or organization that helps the environment or animals. Until then, she’s planning her next big art project (she would love to paint a mural for an organization that supports animals) and balancing working as a graphic designer and her art. Yeisy graduated in May from Florida State University and is balancing working as a graphic designer and her art. It would seem like she has it all figured out but her assuredness didn’t come overnight. Her work comes from “finding my own way” and educating herself on the subjects that matter to her. But she wants people to know, that even if you’re not an artist or an activist, it’s okay. For more information on Yeisy and her artwork, visit her website. You can also follow her on Instagram or Facebook.